You can schedule a Microsoft Lync Online meeting by using the Online Meeting Add-in for Microsoft® Lync™ 2010 in Microsoft® Outlook®. You can also use Lync Online to start an unscheduled meeting to discuss something that requires immediate attention. In the Microsoft® Outlook® Calendar, on the Home tab, in the New group, click New Online Meeting(in Microsoft® Outlook® 2010) or Online Meeting (in Microsoft® Office Outlook® 2007). In the meeting request, in the To box, type the email addresses of the people you want to invite to the meeting, separated by semicolons. (Optional) In the body of the meeting request, above the Join Online Meeting link, type additional meeting details. Do not modify any of the existing text in the meeting request. Doing so may prevent people from joining the meeting. (Optional) In the meeting request, on the Meeting tab, in the Show group, click Scheduling Assistant. Use the Scheduling Assistant to ensure that everyone is available during the time you choose. In the meeting request, in the Online Meeting group, click Meeting Options, and then accept or change the default options as required. In the meeting request that you created, on the Meeting tab, in the Online Meeting group, click Meeting Options. In the Meeting Options dialog box, select the Customize access and presenters for this meeting check box. Under Access and Presenter, choose the options appropriate to the size and type of meeting that you are scheduling. For guidance, see the screenshots and tables at the end of this procedure. Click Audio and Phone, to view your meeting audio conferencing information. If you do not see the Audio and Phone option, this means your meetings will use VoIP audio only and that PSTN (public switched telephone network) audio conferencing is not enabled for your organization. For more information, contact your IT administrator. Access options control which participants must wait in the lobby before being admitted by a presenter. The following table describes each option in detail. You don’t want people viewing your handouts or Microsoft® PowerPoint® slides before the meeting. You’re discussing something sensitive or confidential. This check box is off and inoperable when the meeting is “locked” (option 1); off but selectable with options 2 and 3; on by default when there are no access restrictions (option 4, shown here). Presenter options control which participants are automatically given presenter privileges when you schedule the meeting. The following table describes each of these options in detail. For presentations where the participants don’t need to interact with the meeting content. Note that you can designate additional presenters during the meeting. For group work sessions where the participants work at your organization and can share and modify meeting content. For group work sessions with people who don’t have an account on your network. For presentations with more than one presenter. To invite people from your Contacts list, click Invite by Name or Phone Number, select one or more contacts and then click OK.
To invite people by sending an email message, click Invite by Email, copy the meeting information, and then fill out the meeting request. To join a scheduled meeting, follow these steps. You can configure Lync to connect to the meeting audio the same way every time or to prompt you for a choice. 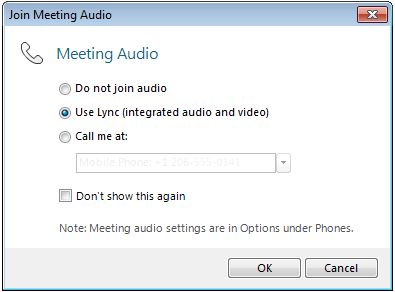 The first time you join a Lync meeting or conference call, the Join Meeting Audio dialog box appears. Be aware that you might see different choices depending on how Lync is configured in your organization. In the Join Meeting Audio dialog box, select the option you want. For details, see the table at the end of this procedure. (Optional) Select Don’t show this again to use your audio connection choice for every meeting. Click OK to join the meeting. You’ll dial in to the meeting using the phone number supplied by your ACP. You’ll use the computer audio and video integration that is built into Lync. You want the Microsoft® Lync™ Server 2010 communications software to call you. You can specify a new phone number in the text box or use one of the numbers displayed. These numbers are those that you entered in the Phones options in the Lync - Options dialog box. To have your audio conferencing provider call you, choose a phone number from the list. 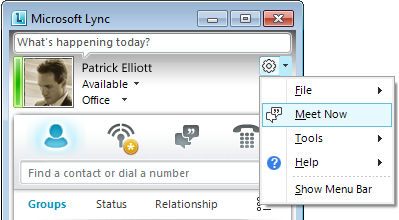 Note: This option is not available in the current release of Lync Online. To use a phone to call into meetings, choose Do not join audio. People inside or outside your organization can join a Lync meeting from a computer that does not have Lync installed. Important: Lync Web App requires the most current version of the Microsoft Silverlight browser plug-in. If Silverlight is not already installed, you must have administrator privileges to install it. For details, see Join from a computer without Lync Online installed, in the Lync Online Help at Office.com.